Assertiveness is defined as the art of clear, honest and direct communication. An assertive approach builds self-esteem and strengthens our ability to make our own choices in life, by helping us to manage the anxiety and stress of communicating in difficult situations. Instead of being governed by the need to either please or blame others, assertiveness teaches us to take responsibility for our own feelings and behaviour. A Woman in Your Own Right has become the core assertiveness training handbook, recommended in confidence building and personal development courses, coaching and mentoring programmes as well as counselling and therapeutic contexts throughout the UK and, with subsequent translations, in many parts of the world. 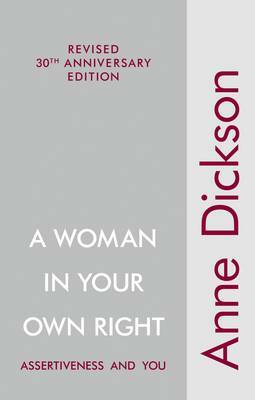 Most importantly, it has helped millions of women who have been inspired and empowered by this book.